Today I want to write about a really cool species of snake, the Antiguan racer. These beautiful snakes grow up to 1 metre long, with the females almost twice as long as the males. 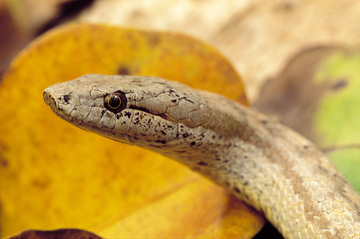 Antiguan racers mainly eat small lizards, hiding under a pile of leaves and ambushing their prey. They are a very gentle snake and are completely harmless to humans. Antiguan racers used to be very common on the island of Antigua in the West Indies, but the introduction of rats and mongooses killed them off. They were thought to be extinct until a small population was found on a nearby island. Since being rediscovered in 1995 conservation efforts have helped their numbers to recover slightly, but they are still thought to be the rarest species of snake in the world. Are there any other interesting facts that you would like to share about Antiguan racers?